It's no secret that foodborne illnesses pose a severe threat to your patients' health. According to The Centers for Disease Control and Prevention (CDC), a staggering 300,000 people are hospitalized, and 5,000 Americans die each year from foodborne illnesses. However, despite the immense danger foodborne illnesses pose to patients, many long-term care facilities and hospitals are not practicing safe food storage techniques. As a foodservice professional, it's important to recognize that food safety goes beyond maintaining clean cooking utensils and practicing proper handwashing techniques. In honor of September being food safety month, we’ve created a guide to help you keep proper track of your inventory, and reduce the chances that your patients become sick due to cross-contamination and improper food storage techniques. Raw meat, poultry, and fish carry various types of bacteria, and if they are not treated, handled, and stored correctly, this bacteria can cause severe illness in humans. A simple way to help you keep track of your inventory and avoid cross-contamination is to implement a color-coding system. White or Clear: Use a white or clear foodservice storage box for bakery-like foods such as pastry and dairy items. Also, aim to prepare bread, pastries, and cheese on white cutting boards for consistency. Be sure to store eggs separately, as they contain salmonella bacteria. Red: Use a red food storage container to store raw meat, and red utensils and a red cutting board to prepare raw meat. You should always keep raw meat away from other types of food and preparation stations. Also, you should always wash your hands after handling raw meat, and all utensils used to prepare it should be adequately cleaned and sanitized immediately after use. Yellow: Consider using a yellow food storage bin for prepared meat. It's important to note that cooked meat should always be kept separate from the raw meat. Once meat is cooked, the bacteria is removed from it. Placing prepared meat near raw meat could result in contaminating the prepared meat. Yellow utensils and a yellow cutting board should also be used to prepare cooked meat for consistency. Blue: Blue food service bins and blue cutting boards are often used to store raw fish. It's imperative to keep raw fish away from raw meat, as some of your patients may have a fish or shellfish allergy. Green: When you think of fresh, what color comes to mind? Green of course! Thus, it makes sense to utilize green food storage containers to store fruit and salad, and green cutting boards and utensils to prepare them. Brown: Brown food storage boxes, cutting boards, and utensils can be used to store and prepare all of your vegetables. While it isn't necessary that you follow our color recommendations, it is essential to implement a color-coding system that makes sense for your facility. Failing to do so could result in extreme sickness amongst your patients, and in extreme instances even death. 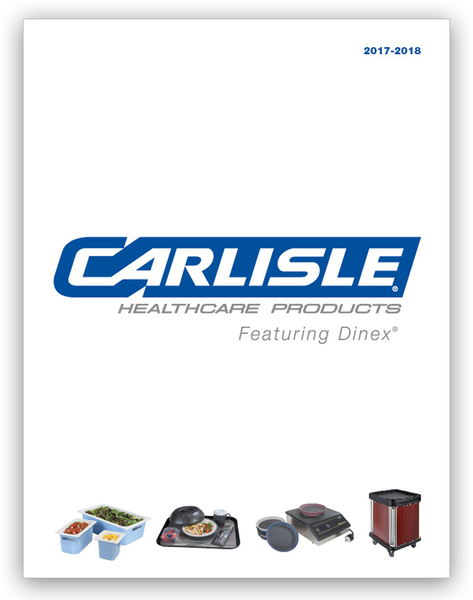 Carlisle’s StorPlus™ color-coded food storage boxes are the solution you need to kick-start the implementation of your color-coding system. These color-coded food storage containers with lids meet HACCP standards and are constructed with reinforced polycarbonate for added strength and rigidity. While these food storage containers are colored, they provide a clear view of the contents inside so you can quickly identify food items. StorPlus™ foods storage boxes will help you store and transport bakery, produce, fruits, meat, and dairy items so you can reduce the chances of cross-contamination in your kitchen. This line of color-coded commercial cutting boards and brushes will help you meet HACCP guidelines by creating segregated food preparation areas to avoid cross-contamination and foodborne illnesses. All Sparta® Spectrum® color-coded cutting boards are NSF listed and dishwasher safe. Properly storing your inventory is only one piece of the food safety puzzle. You must also practice proper food labeling. According to Restaurant Magazine, food should be labeled as soon as it is delivered to your facility’s kitchen. Labeling food will help you communicate what food needs to be used first, and will ensure that you are following the correct food safety procedures for quality and freshness for various types of products. Gordon Foods advises that all food items that require time and temperature control, (TCS) should be labeled with the common name, the date it was prepared, and the use by date. As a guideline, TSC food can be kept for seven days if stored at 41 degrees Fahrenheit or lower. It’s critical to remember that day one is the day the product was prepared. You should also label food products that are not being observed for temperature control. For instance, if a temperature control food is being served, but the temperature is not being maintained it needs to be labeled with the name, the time it was removed from refrigeration, and the time it needs to be discarded. As a guideline, cold foods should always be sold or served within six hours of being removed from the refrigerator. Alternatively, hot foods should be served within four hours. The San Jamar Saf-T-Label™ Dispenser is the product you need to help you organize and label your inventory. This foodservice label dispenser can dispense up to 11, 1" wide label rolls or five 2" labels. Save hours of time with the San Jamar Saf-T-Label™ Dispenser by easily separating your labels from their backing paper, and save precious counter space in your kitchen via its integrated brackets that are capable of hanging on a wire shelf or via wall-mount brackets. Start labeling with ease and order yours today! We recognize that practicing proper food safety and managing your inventory goes beyond color-coding and labeling. Here are some additional storage tips to help you take your food safety and inventory management process to the next level. To make sure you are serving only the freshest food, you should follow the FIFO rule. FIFO stands for first in, first out. The FIFO rule requires you to store new food behind old food once it is delivered. FIFO is your safeguard to ensuring you do not serve spoiled food to your patients and their guests. It will also help you avoid food waste by identifying which products you should use first, so you can eliminate the chance of your inventory becoming outdated. According to Restaurant Magazine, food starts to spoil the minute it comes into contact with air. Thus, it’s critical to keep your food in airtight containers. Airtight food storage containers will help you increase the shelf-life of your inventory. As we discussed earlier, raw meat has bacteria in it that can cause severe illness if ingested. To reduce the chances of contamination during storage, store raw meat at the bottom of your refrigeration unit to stop juices from dripping onto and contaminating other food items. Practicing proper food safety starts with maintaining a clean kitchen. All of your equipment, shelves, cooking surfaces, and preparation stations need to be cleaned and sanitized every day to avoid bacteria build-up. Your refrigeration units will operate at optimal levels if they are not over-stuffed. Over-stuffing your refrigerator could result in your food items dropping in temperature and spoiling. If you serve these foods to your patients, you could end up with a significant problem on your hands. While September is food safety month, practicing proper food safety is a year-round job. If you do not have a color-coding system in place at your facility, now is the time to get started. Consider investing in color-coded food storage boxes to help you separate and easily identify your inventory. Also, consider color-coordinating your cutting boards to match your food storage boxes for consistency. While proper food storage is a critical element of food safety, it's equally important to correctly label your inventory to reduce the chances of cross-contamination and food spoilage. Remember, proper food safety cannot be accomplished without a plan and proper internal communication. Make sure to communicate the importance of food safety to your staff, and ensure all team members fully understand what is required to maintain a clean and contamination-free kitchen. By following the tips we provided in this article, you will be well on your way to maintaining a high standard of food safety year-round.